Letter from Lankes to Jaffe regarding his progress on researching his father's papers at UVA, interest in the Sherwood Anderson content, and the disposition of J. J. Lankes materials still in his son's possession. Lankes, J. B. (Julius B. ), 1915-2010, “Letter, J. 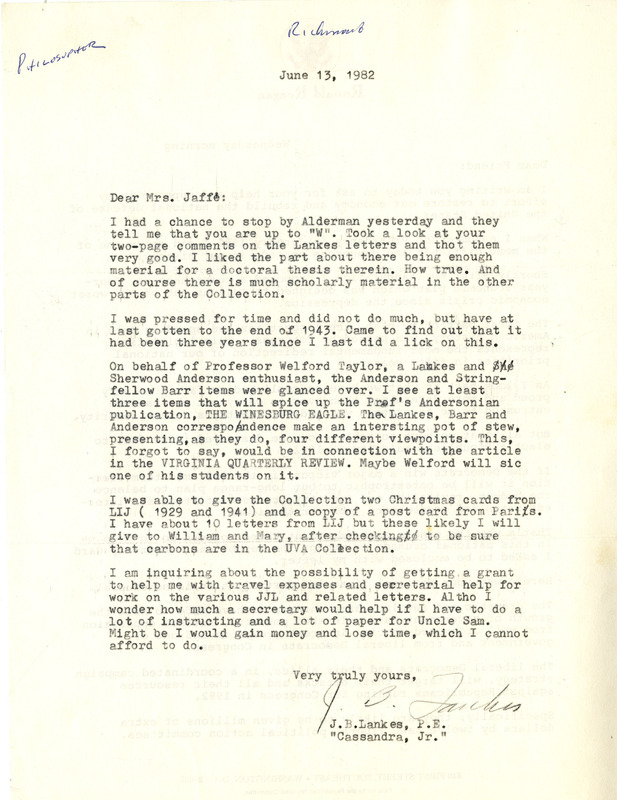 B. Lankes to Alice Jaffe, June 13, 1982 (Ms2019-014),” VT Special Collections Online, accessed April 23, 2019, http://digitalsc.lib.vt.edu/Ms2019_014_JaffeLankes_/Ms2019_014_JaffeLankes_B1F5_LankestoJaffe_1982_0613.